There are no right choices. There are only our choices. As for mine, I'd take Paris. Like her father, she could easily drift off to sleep and slumber through the night. Didn't they count worries? Didn't they imagine their fondest dreams coming true? Weren't they afraid that if they lost control, something terrible might happen? Aren't you glad we changed the days? Katie asked. We didn't change the days;we let the days change us. That's some deep stuff, Mommy, she teased. A trip doesn't have to be perfect to be great, Mommy. We got to see the ruins of Pompeii. Do you know how lucky we are? Katie instinctively knew what I had struggled my entire life to grasp. And I still hand't really gotten it. Eluding me was the ability to focus on what I had, rather than what I had lost or could lose. It was just a silly lyric my father wrote in his youth, but a philosophy he clung to until the end. And I wasn't sure I completely agreed with it any longer. I think we should remember the better times. I believe we should reminisce about the wonderful days and happy hours. But I also don't think it's healthy to ban flowers, symbolic or otherwise. Asking someone to force mourning and accentuate the positive sounds noble, Doing so took its toll on me though. An honest, tender hearted memoir, about how a daughter can show a mother how to really live! We'll Always Have Paris is the memoir of Jennifer and her daughter Katie and their adventures through Europe. They start with Paris but end up traveling all over Europe. Fun adventures,disappointments, mishaps,and lessons learned along the way. These two woman grow up through their Paris trips together. They learn to appreciate the finer things in life that money can't buy such as seeing an historical monument even if it means running for the bus and leaving their luggage with foreigners. They learn that adventure is more about the experience and less about schedules. The second I got the email requesting a review of this book, I was so excited I just couldn't wait to start reading it. It took me a bit longer than I expected to get through it, only because I was (as usual) reading other books too. I also found myself back tracking and rereading certain sections of the book because I just wanted to laugh again or experience Paris again whichever way you look at it. I experienced a real connection as a mother to this book. I found myself thinking and feeling the same things Jennifer was feeling in the memoir. I was completely jealous that she was able to spend this much travel time with her daughter Katie and I found myself wondering when I would in fact be able to plan such a trip. I have put it on my bucket list and plan to follow through with it too. Like the roller coasters Jennifer describes enjoying with her father on Coney Island, this book took me on a ride from snorting giggles one moment to tear-filled eyes the next with few paragraphs in between. The story touches on Jennifer's childhood and mirrors her parents life at times during their journey. She touches on her sadness as a child spent with her mother and her father. She touches on sad memories, heartbreaking memories and even hilarious memories and through it all, we get to see the growth Jennifer is experiencing along the way. We'll Always Have Paris is a true gem that should be cherished by every mother, read to your daughter and remembered for years to come. 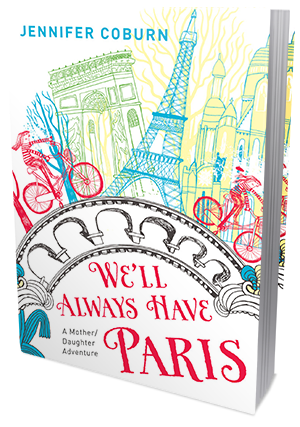 Win a signed copy of "We'll Always Have Paris"!! literary anthologies. 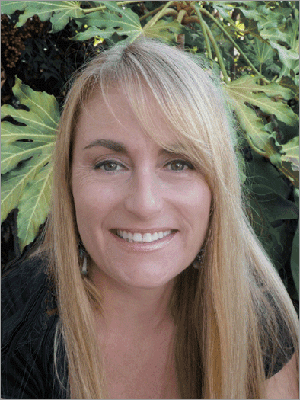 Jennifer has written for U-T San Diego, Miami Herald, Mothering magazine, The Huffington Post, Salon.com, and numerous other newspapers and magazines. She lives in San Diego with her husband William and their daughter Katie.